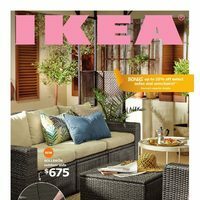 IKEA IKEA Springtime Spree: Up to 25% Off Select Armchairs and Sofas + More Take Up to 25% Off Select Armchairs, Sofas + More! Liven up your living room with a trip to IKEA, because they're holding a Springtime Spree Event where you can take up to 25% off select armchairs and sofas, along with deals on a selection of other products! We've listed a few eligible sofas and the featured Springtime Spree deals to provide some decor inspiration. The IKEA Springtime Spree Event is effective until April 29 online, in IKEA stores and at Pick-up and Order Points, with a limit of four items per customer. IKEA charges a flat-rate fee starting at $79.00 for delivery to addresses in select regions or $20.00 for delivery to a Pick-up and Order Point. Thanks op. I see some of the ektorp covers are on sale. For those that have the EKTROP, how has the quality been? Just got a house and looking at seating options. Thanks in advanced! Personally I think that the Ektorp has to be the least comfortable sofa I've ever sat on in my life. The price really shows on this one, imo, and we used to have one in our family home for years, hated the thing.